With the sun shining on tree-shaded campus and red school buildings, Tagore International School was extraordinarily beautiful. Having heard the news that Chinese Premier Wen Jiabao would visit the school, the entire campus was immersed in a festive atmosphere on Dec. 15. After a lapse of five years Premier Wen visited India again. Over the past 5 years, the China-India strategic cooperative partnership for peace and prosperity has seen great progress. At about 13:45 local time, Premier Wen arrived in New Delhi, beginning his trip of friendship and cooperation to India. Having addressed the China-India Business Cooperation Summit, Premier Wen came to Tagore International School at about 16:40. Crowds of students dressed in national costume were waving the national flags of China and India on the campus and speaking Chinese to welcome Premier Wen. Tagore International School is a well-known school in New Delhi, with more than 1,800 students. Accompanied by Principal Madhulika Sen and surrounded by teachers and students, Premier Wen walked into the auditorium of the school. In bursts of applause, Premier Wen sat down together with 30 student representatives and some teachers of Tagore International School. Principal Madhulika Sen told Premier Wen that Tagore International School had very close cooperation with Shanghai Jinyuan Senior High School for the past four years. "There are frequent visits between the teachers and students of the two schools. Every Thursday, we will teach the students of Jinyuan yoga via video connections. Every Friday, The teachers of Jinyuan will teach us Chinese characters and calligraphy." The students then took out their carefully-prepared calligraphic works and showed them to Premier Wen. Having appreciated their works, Premier Wen praised, "Well written!" The Chinese premier was always smiling to them. The premier in front of them was so amiable that he just looked like a neighbor’s grandfather. Abhishek Sankritik, president of the student council of Tagore International School, stood up and asked, "Premier Wen, I’d like to welcome you on behalf of students. Can we take the liberty of calling you Grandpa Wen?" Premier Wen smiled, "You call me Grandpa Wen. I am much moved and very happy. The children in China also like to call me Grandpa Wen." Abhishek went on, "This year, I visited the Shanghai World Expo as a member of the delegation of Indian students. I also participated in the international competition on scientific and technological knowledge in Shanghai. The trip left me with a very deep impression. Starting from next year, our school will open the course of Chinese mandarin at grade 6, but I'm about to graduate." Abhishek's regret also represented the aspirations of the students. They like the Chinese language and are eager to learn more about China. Students were all eager to speak their minds to Grandpa Wen. "I'm a representative from the ninth grade." A boy wearing glasses caught the opportunity to speak. "My brother is studying in Zhejiang University. I once visited the Great Wall, Huangpu River and Hangzhou. I intend to go to a Chinese college after graduation and do something to promote cultural exchanges between China and India." Premier Wen was so pleased that he started applauding for his ambition. "Hello, Grandpa Wen!" Tushar Rawal, a student sitting on the right side of Premier Wen shouted in Chinese, "Many of us know the Chinese Monkey King and the martial arts. Do you know about Tagore in India?" Premier Wen stood up and talked effusively to the students, "Tagore is a well-known Indian writer. His most famous collection of poems is 'Gitanjali'. He also specialized in composing and painting. India's national anthem 'the Will of the People' was composed by Tagore. Tagore is also well-known to every household In China. He visited China in 1924. The first stop was Shanghai. Liang Qichao, Bing Xin, Xu Zhimo and many Chinese writers were influenced by him. He is a good friend of the Chinese people. During Indian President Pratibha Patil's trip to China this year, a bronze bust of Tagore was erected in Shanghai." The children were amazed by the fact that Premier Wen Jiabao was so familiar with Tagore and the Chinese people love Tagore just the same as Indians do. Looking at the crystal eyes of the students, Premier Wen went on to say, "Your school follows Tagore's philosophy of faith in yourself. I encourage you to study hard, think independently, and achieve full development just as required by Tagore." "How much score can I get?" asked Premier Wen with a touch of humor after he answered the question. "Full score," Rawal said loudly. The hall was resounded with knowing laughter. "How do you see the cooperation between India and China?" A student caught this rare opportunity and stood up with the question. "China and India are the world's two most populous countries as well as major emerging developing countries with ancient civilizations. The China-India friendship has a time-honored history which can date back to 2,000 years. Since India and China established diplomatic relations, especially in the last ten years, bilateral friendly cooperation has witnessed rapid growth." Premier Wen said, "You need to understand such a fact that the combined population of China and India is 2.5 billion and the friendly cooperation between the two countries will definitely affect Asia and the world." A teacher dressed in a red sari stood up and asked, "Every time I visit China, I am greeted with warm hospitality. How do the Chinese people make it?" Premier Wen smiled, "Because our two peoples are friends. This time, we also feel the warm hospitality of the Indian people." 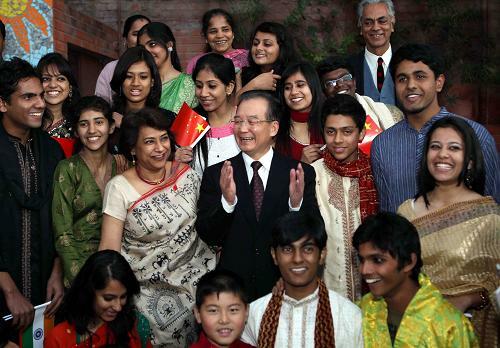 Premier Wen Jiabao was very happy to stay together with the children who love the Chinese culture and are interested in cultural exchanges between China and India. He always stood to answer questions from students. Principal Madhulika Sen also raised a question to Premier Wen, "What do you want to say to Indian students?" "I like staying together with the kids. This is also why the kids like me. I feel at home together with you. I feel very happy as if I become much younger. Language is a tool for communication between the minds as well as a bridge of friendship. I heard that the Central Board of Secondary Education of India announced including the Chinese language as a foreign language into the secondary school curriculum. This is a very meaningful thing. There would be more Indian children to learn Chinese in the future. It will certainly promote the friendship between China and India." Premier Wen went on to say, "My children also practice yoga. Before this visit, I asked 'how to use the most concise language to explain yoga'. The answer is 'yoga is a combination of mind and body.' The Chinese characters have a long history. In 221 BC, Qin dynasty unified China and the Chinese words. Over the past 2000 years, the Chinese characters have been enriched not only in terms of contents and but also in terms of its script styles. We have now regular script, official script, running script, cursive script and other script styles. I think the Chinese calligraphy is a combination of mind and strength. Where your mind goes, the vigor of the style will follow." The Indian teachers and students present were all amazed by Premier Wen's deep understanding of the Chinese calligraphy. His explanation and elaboration on the Chinese calligraphy were like the dews spraying in the hearts of students. Premier Wen then went to the desk, took up the writing brush and dipped it in black ink. He then wrote down the four vigorous and forceful characters on the paper: China-India Friendship. "Dear students, you need to not only remember the words, but also act accordingly in the future." Premier Wen said earnestly. "Come, I'll teach you how to read the words." Premier Wen turned around and stood before the tablet. He wrote down the four words neatly and read them aloud, "China-India Friendship". Students followed Premier Wen and read out aloud, "China-India Friendship". The sound sent out the profound friendship between the people of India and China and expressed the best wishes for the friendship between China and India for generations to come. Before leaving, Wen said to the students, "I brought 1000 Chinese books and some audio-visual materials for you to learn. I wish that you could become the envoys for cultural exchanges between China and India." Teachers and students were reluctant to bid farewell to Premier Wen. The Just-one-hour interactions left them with a beautiful memory. Rawal said, "Premier Wen told us today about China-India friendship and culture. He gave us such a clear exposition of the Chinese calligraphy. What's more surprising is that he has such a deep understanding of Tagore. My greatest feeling is that this is more like a family dialogue, a dialogue between grandparents and grandchildren. I feel so familiar..."